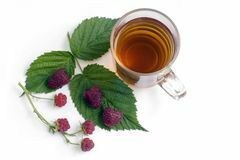 Red raspberry leaf tea (RRLT) is beneficial before, during and after pregnancy. It is used as an anti-nausea remedy (not only in pregnancy); and it has helped to prevent severe hemorrhaging during labor and after childbirth. It may also help in relieving labor and after-pains. It even cleanses and enriches breast milk production! RRLT has many other non-pregnancy medicinal uses for both male and female, but will not be listed in this article. Red raspberry leaf tea does not start labor or promote active labor contractions, because it is not an oxytocic herb or *emmenagogue for that matter. Therefore, it is a myth that red raspberry leaf tea causes preterm labor. In fact, what it does is help strengthen and tone the pelvic and uterine muscles. It conditions it, so when active labor starts the muscles will be more efficient. It also may even help with preventing general uterine fatigue. Alpha-Carotene, Alpha-Tocopherol, Ascorbic Acid, Boron, Calcium, Chromium, Manganese, Niacin, Pectin, Phosphorus, Potassium, Riboflavin, Fiber, Iron, Magnesium, Malic Acid, Selenium, Silica, Thiamin, Zinc. Now! It is best to start before pregnancy, but don’t sweat it and begin right away. Add 1 heaping teaspoon of red raspberry leaves to each cup (8 oz) of hot steam-distilled water. Put water in pan, turn the stove on high and bring it to a boil usually 10 minutes. Pour the boiling water over the herbs and then steep 15 – 20 minutes, strain and drink three cups/day. Enjoy! Have you always wanted to start your own organic garden? Plant a red raspberry plant! They grow great here in Utah. Every year after your red raspberry bushes have been harvested, cut off the leaves and lay them out to dry (a flat surface is fine). You might even get some dried berries making the tea a pinkish red color. After the leaves are completely dried out, crush with your hands and place them in a tightly sealed container of your choice. You’ll have natural red raspberry leaf tea at your convenience. Now, how easy is that? Reblogged this on Alda's Preconception, Birth & Postpartum Doula Services .